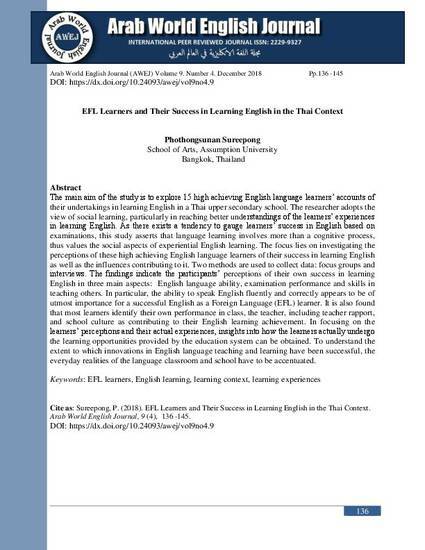 The main aim of the study is to explore 15 high achieving English language learners’ accounts of their undertakings in learning English in a Thai upper secondary school.  The researcher adopts the view of social learning, particularly in reaching better understandings of the learners’ experiences in learning English. As there exists a tendency to gauge learners’ success in English based on examinations, this study asserts that language learning involves more than a cognitive process, thus values the social aspects of experiential English learning. The focus lies on investigating the perceptions of these high achieving English language learners of their success in learning English as well as the influences contributing to it. Two methods are used to collect data: focus groups and interviews. The findings indicate the participants’ perceptions of their own success in learning English in three main aspects: English language ability, examination performance and skills in teaching others. In particular, the ability to speak English fluently and correctly appears to be of utmost importance for a successful English as a Foreign Language (EFL) learner. It is also found that most learners identify their own performance in class, the teacher, including teacher rapport, and school culture as contributing to their English learning achievement. In focusing on the learners’ perceptions and their actual experiences, insights into how the learners actually undergo the learning opportunities provided by the education system can be obtained. To understand the extent to which innovations in English language teaching and learning have been successful, the everyday realities of the language classroom and school have to be accentuated.